[CONT](VC/RC):Restraint (This unit cannot attack.) [ACT](VC/RC):[Counter Blast (1) & Choose another of your «Oracle Think Tank» rear-guards, and put it into your soul] This unit loses "Restraint" until end of turn. [CONT](VC):During your turn, if you do not have any rear-guards, this unit gets [Power]+10000/[Critical]+1 and loses "Restraint". Hey guys, Azure here. Sorry its been so long, haven't really had much to say on days I'm really available to write. But here we have Imperial Daughter. Okay so her effect is pretty straight forward, if you have no field, she gains +10k Power and 1 Critical. So basically if you're getting wrecked and have nothing, you get this, which basically requires 20k shield and yeah its game over. What makes this card even worse is her restraint. Lets say Imperial Daughter has a friend over for dinner, but because of her restraints she is unable to get up and get the food for said Oracle Think Tank friend. So Imperial Daughter asks the friend to come remove her restraint and she eats her friend after the restraints are removed. At this day and age, most players are used to deal with 21k attacks, dealing with them is not difficult. Guard for 20k and unless they sack two triggers well then then they get nothing. If the defending player perfect guards or guards for 25k, nothing again and you can't even pass the trigger off. This card is pretty bad between the fact it requires an empty field and has restraint. Its highlight is mainly its 11k defense or if its late game you can MAYBE push through, I really dont see this card being useful outside of being extremely situational. 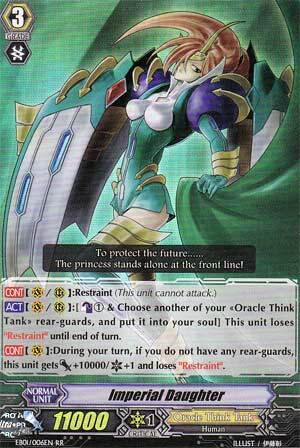 [ACT](VC/RC):[Counter Blast (1) & Choose another of your «Oracle Think Tank» rear-guards, and put it into your soul] This unit loses "Restraint" until end of turn. [CONT](VC):During your turn, if you do not have any rear-guards, this unit gets [Power]+10000/[Critical]+1 and loses "Restraint". So Oracle Think Tanks have another ace unit, huh? I guess Amaterasu, Tsukuyomi, Sakuya and CoCo weren't enough then! Anyway, There IS one thing that Imperial Daughter has over the other 4 and that's the face that she is 11000. That extra 1000 power makes it so much easier to guard than normally (don't believe me? try throwing down a 10000 shield against a 20000 attack then give me a call. xP). Now with that said, there's one glaring drawback that I think was pretty stupid in my opinion, and that's that unlike other 11000 Grade 3's where they would just lose 2000 power if there was a unit that wasn't in the same clan as it, it instead has Restraint?! Restraints were made for Grade 2 11000 units, NOT Grade 3's, but before I go on a huge rampage about this, let's take a look at how she would lose her Restraint. At the cost of a Counterblast 1 and putting a Oracle Think Tank unit into your soul, she loses Restraint. That's not bad especially if you were using a deck that utilize the 6+ soul as it would feed the reason why you would play some of those cards. However, there IS one extremely special loop that can be used and abused with Imperial Daughter and Little Witch, LuLu. Obviously, LuLu would be your starting Vanguard, and when you ride into Imperial Daughter, you would bring LuLu out of the soul, Soulblast 2 and draw a card. After that, you would use Imperial Daughter's skill to lose Restraint by putting LuLu back into the soul. After that, normally, you would use a Psychic Bird or other means to add another soul in and then ride into another Imperial Daughter thus looping LuLu's skill. Now, with that being said, I haven't covered her final skill, and that's if she's all alone on your field, then she automatically loses Restraint, gains a bonus 10000 power and +1 Critical. That right there is both good and bad for various reasons. It's excellent in an early game basis seeing how you can sneak in a few critical hits before your opponent devotes to the field. However, in a mid-late game status, seeing how you will only be getting 1 attack in per turn, it'll make it easier on the opponent to guard the "Lone Wolf" of the Imperial Daughter. In conclusion, Imperial Daughter is an excellent unit to have in a early-mid game time period, but once things are going down to the wire, she will sooner or later be needing to call for reinforcements.